CHEMICAL Leaman had 4 or 5 MB's at Midland Mi. terminal in the70's and 80's. 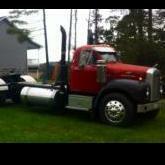 Mack n/a diesels tandem rears,duplex trans. easy to work on with tilt cabs. Ps dont forget to LATCH THE CAB DOWN when moving from one work bay to another. This is a long shot, but years ago I had one with similar symptoms that had a cracked intake manifold. It was cracked on the bottom side and could only be seen with small mirror . Vic,I am located between Midland Mt.Pleasant if you need any help email me for my cell number at arthursiding@hotmail.com. Passed a superliner hood in a overgrown yard the other day. No one home.Any value for resale? At least would look good hanging on wall in garage. Mark was agreat guy to watch pitch. they called him The Bird after Big Bird on Sesame Street because of his antics on the mound.Too bad his career ended so soon. Is there any interest in these engines? Are they getting hard to find? Are new parts available? I believe they sold out or reorganized in the late 80's or early 90's ? Yes they are now Quality Carriers ,hq is now Fla. instead of Pa.When I worked for them in the 70's and80's they had over 2500 tractors and 4000 trailers if my memory is correct. Probably 90 % Mack afew frtliners afew GMC Astro's and an ocasional White. Ok guys Ihave been away from the trucking industry for about 25 yrs. We had a pretty good size fleet of Cruiseliners at Leaman tank lines when I was there.Where did they all go?Ours all had alum. frames and cabs if I remember .Airride cabs too . Hi everyone been reading your forum for over a year now and finally decided to join .Was a mechanic for Chemical Leaman Tank way back in the 70's and 80's at their terminal in Mi. Worked on Rs MB F Bs oh and Cruiseliners . Always wanted a B to restore.Am still looking.Probably have to quit collecting Winchesters and bird dogs first. Love to see pictures of Macks here.